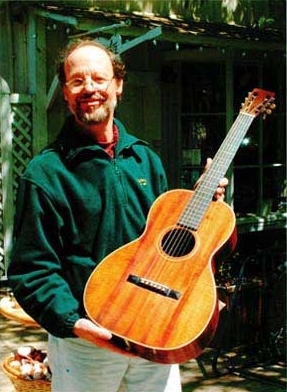 in front of his shop, Schoenberg Guitars, in Tiburon, California, in 2001. The guitar travelled 2,750 miles from Ralston, Pennsylvania, to Tiburon. This was its first trip in 75 years. Eric converted the guitar to Spanish style playing, and was the first person to play it thusly. has a special interest in the history of the guitar in Hawaii. he stumbled upon Earl's guitar in Eric Schoenberg's shop. documents that accompanied the instrument. grand-daughter and Jacob Janet's son and daughter. he contacted C.F. Martin IV in Nazareth, Pennsylvania. 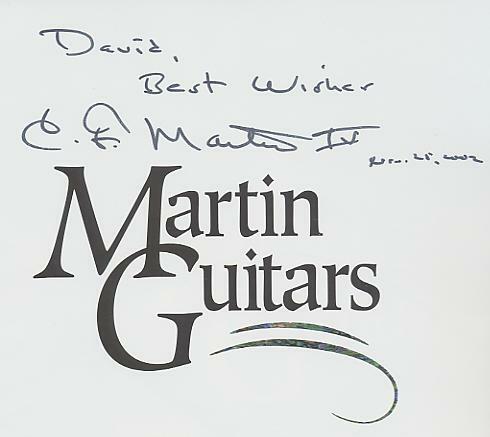 The Martin Guitar Company purchased the guitar for their Museum. his grandson, C.F. Martin IV, bought them back in 2002.
having returned home to the place where it was made.